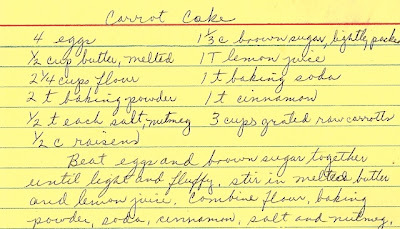 I can't tell you how much this recipe means to me, not because I remember my Grandma making this cake, but because it was my Grandma's recipe. Just look at her beautiful cursive handwriting. I don't remember my Grandma cooking a lot while I was growing up, except for on Holidays and family get-togethers. Maybe it was because I was young and didn't care about cooking and I didn't pay attention much (shocking, I know). I was talking to my Grandpa and I found out that my Grandma loved to cook and bake and he said she was really good at it. He said she loved to sit and watch cooking shows like Gabby Gourmet and Julia Child and loved to copy down recipes every chance she got or cut new recipes out of newspapers. (Now I know who I got it from!) He then showed me a huge drawer full of recipe boxes which were full of handwritten recipe cards and newspaper clippings. I found newspaper clippings from way before I was even born, weird huh? He let me pick out a box to keep (I chose the one in the below picture. Look how cute the bright flowers are. It even has a price tag on the side that says .79 cents - you could never get a recipe box for that price now-a-days). 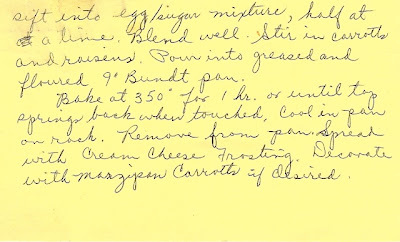 I was so happy to have something of my Grandma's and especially something that I know she once cared enough to take the time to handwrite all of these recipes. I will cherish it forever! 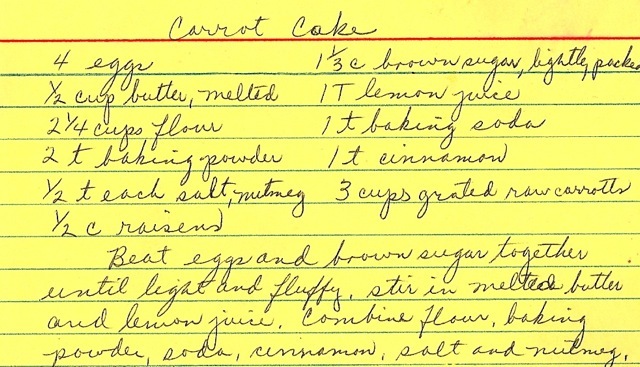 This recipe is the most unique carrot cake I have ever seen. I have never ever seen a carrot cake recipe that uses butter? They always use vegetable oil? Also, all the recipes I have seen use regular sugar, but this one uses brown sugar and it also calls for lemon juice, which I had never seen before? I really should have tried the recipe exactly as she had written, but I decided to add the butter plus some vegetable oil, because I wanted my cake to be really moist. I also added a little more cinnamon and a little bit of regular sugar, but I think you could leave the extra sugar out and it would taste just as good. I decided to cut the recipe in half, since there would only be two of us eating it (that is why the cake in the above picture looks so small). I had big plans to decorate it all cute, but I couldn't wait any longer, I had to try it. It turned out soooooo good. It did sink a tiny bit in the middle, but that was probably because I opened my oven door too soon, but it was incredibly moist and the amount of spice was perfect. I even liked it better the next day. This cake is irresistible. Preheat oven to 350 degrees. Beat eggs and both sugars together until light and fluffy, stir in melted butter, vegetable oil and lemon juice. Combine flour, baking powder, soda, salt, cinnamon and nutmeg. Sift into egg/sugar mixture, half at a time. Blend well. Stir in carrots. Pour into desired greased and floured pan(s). For 9" bundt pan, bake for one hour or until top springs back when lightly touched. I cut the recipe in half and used two small round pans and baked for about 35 minutes. Cool in pan 15 minutes, then invert to a wire rack and cool completely. Frost with favorite cream cheese frosting. What a great story! Plus, the cake looks super tasty as well. I love carrot cake and this one looks sooo good. I can't wait to try it. I can't wait to poke around your blog for a few more yummy recipes. Thanks for posting. It is really nice to see her handwriting again. I also remember that recipe box...so cool that you have it now. I remember grandma making a lot of yummy stuff...I don't remember this one though. 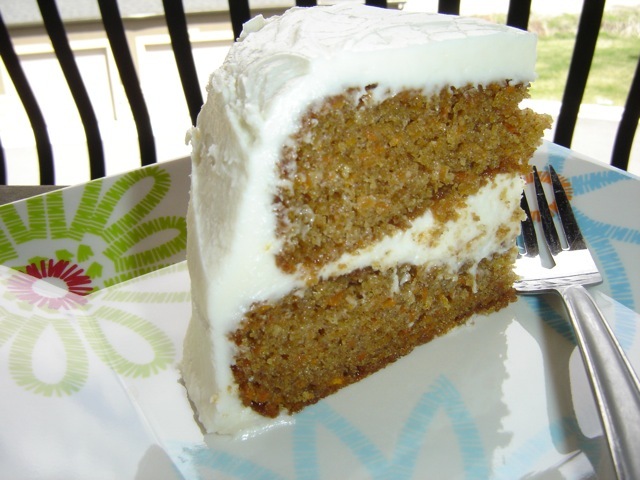 Probably because at the time I didn't think I liked carrot cake:) I will have to make this...looks super yummy! Why do all Grandmas write nice? The cake looks amazing! So beautiful to have her recipes. I don't know what happened to my mom's recipe file but I would sure love to have it. This is the kind of carrot cake I love, just carrot goodness, so silky and moist and nothing crunchy or stringy! I need one now. Love the story and her written recipe card! I want a piece right now! 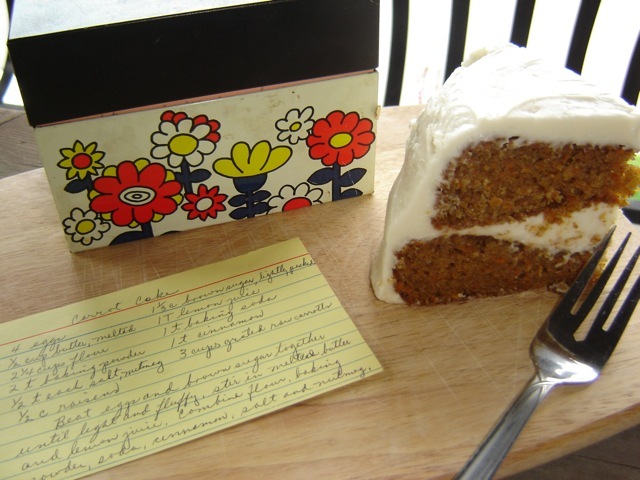 All I can say is that Gramma Parker sure knew how to bake a great carrot cake! I love the card! So Special! Carrot cake is my favorite! 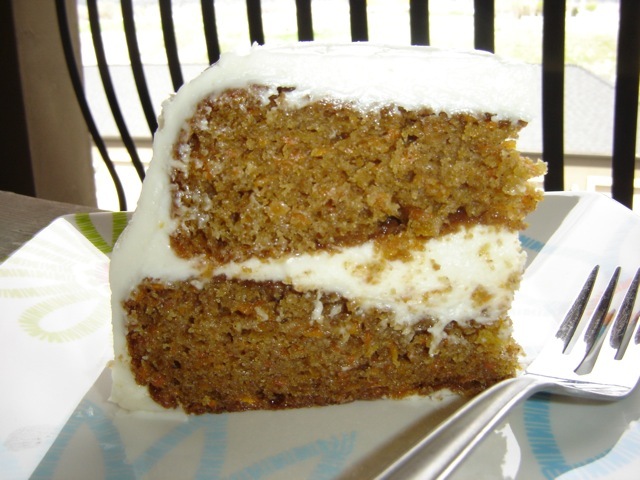 Carrot cake is my fave and this one looks like good old fashioned carrot cake at its best. 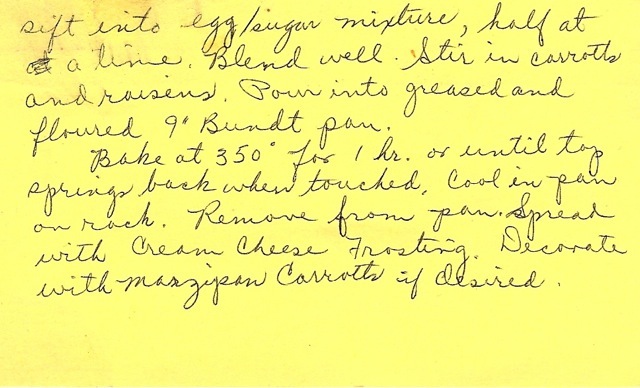 You are so lucky to have your grandma's recipe cards- what a treasure. My auntie gave me her special Carrot Cake recipe. She adds Pecans or Walnuts and Raisin. Skips the frosting. I'm definitely trying this one for Thanksgiving day, interesting the lemon juice. Great story, I love you blog! Thanks for sharing. Just found you (I always go back and start at the beginning when I find a good, new blog), and can't wait to try this. You may have already mentioned this in the next 3 years, but is Gabby Gourmet the same as the Galloping Gourmet? I used to watch him and Julia as a 'tween. Yeah, I'm old, lol.